Los olvidados (1950). In the U.S. variously titled The Forgotten and The Young and the Damned. Susana (1951). In English: The Devil and the Flesh. 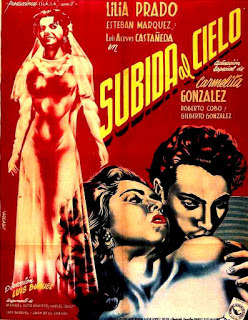 Subida al cielo (1952). In English: Mexican Bus Ride and Ascent to Heaven (the literal translation of the Spanish title). El (1953), In English: This Strange Passion and Torments. 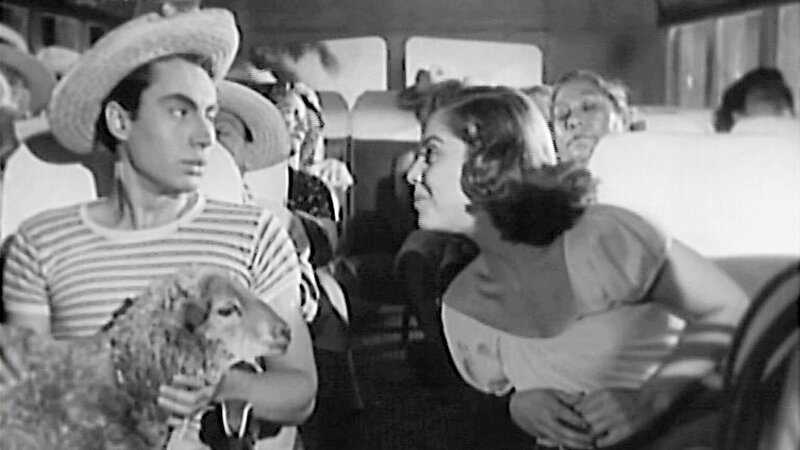 La Ilusión viaja en tranvía (1954), In English: Illusion Travels by Streetcar. Abismos de pasíon (Cumbres borrascosas) (1954), In English: Wuthering Heights. The Adventures of Robinson Crusoe (1954). Ensayo de un crimen (1955). In English: The Criminal Life of Archibaldo de la Cruz. El ángel exterminador (1962). In English: The Exterminating Angel. Of these, the most admirable are the last two, just as the director was ready to step onto the world stage. But the ones I would like to watch over and over again are Mexican Bus Ride and Illusion Travels by Streetcar. In the first film, a young man travels from a coastal village to a large market town on a long bus ride during which one passenger dies, another gives birth, and he himself is seduced by the lusciously ripe Lilia Prado (see photo above). Somehow all works out well, almost magically in fact. I have seen this film half a dozen times and am still not close to getting tired of it. Illusion Travels by Streetcar involves—and tell me this is not unique—a hijacking of a streetcar in which a disconsolate streetcar driver who hijacks a streetcar, takes it on a route of his own devising while offering free rides to a motley crew of passengers who join him on his route. Both films are hilarious and loving. It is obvious that Buñuel had considerable feeling for the people of Mexico, which shows through again and again. This fall, when I travel to Peru, one of the places I hope to visit is Sillustani, near the shores of Lake Titicaca roughly between Juliaca and Puno. When I arrive in Puno by bus from Arequipa, I will have a couple of days to adjust to the 12,500-foot (3,810 meters) altitude around the lake. 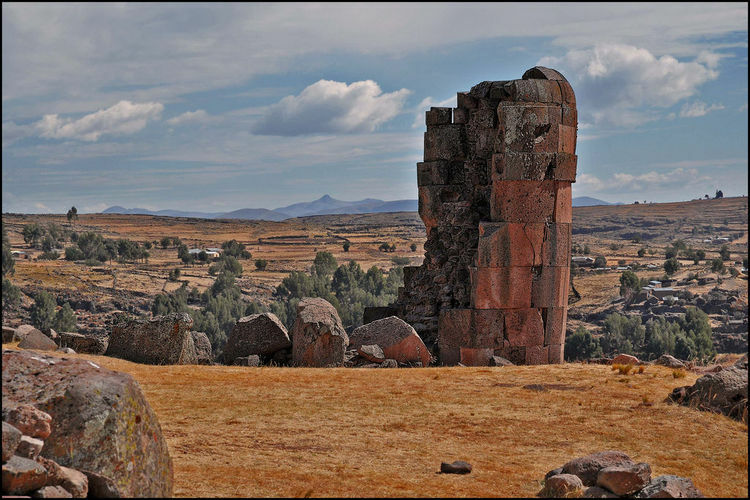 On one of those days, I hope to take a half day tour to visit the chullpas at Sillustani. These are Aymara burial towers, presumably for noble families, of the pre-Inca Aymara people who lived here. One of the things I am beginning to learn is that Peru consists of many more pre-Columbian peoples than just the Incas. 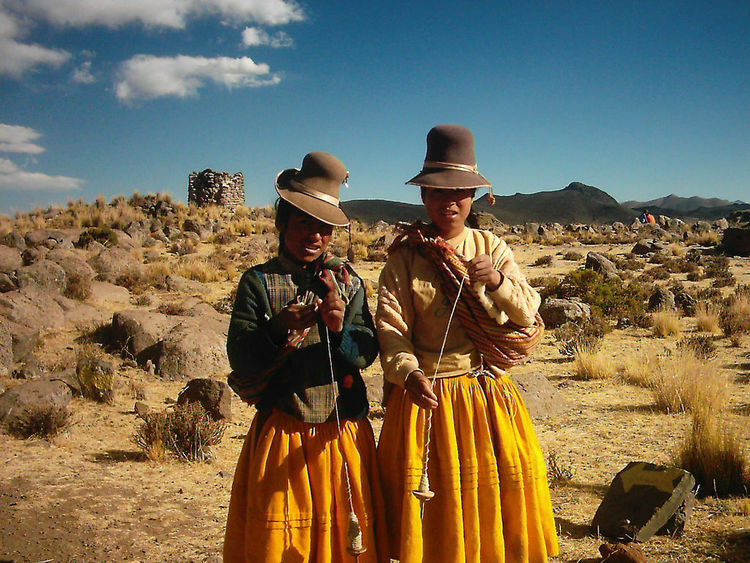 Before 1400, the Incas were a relatively small tribe who created a large empire, largely due to Pachacuti, a.k.a. Yupanqui, whose reign rapidly spread north to Ecuador and south to Chile. Notice the spindles in their hands. From what I understand, both men and women spend much of their spare time creating the textiles for which the area is famous. Uh Oh! More Bad News! 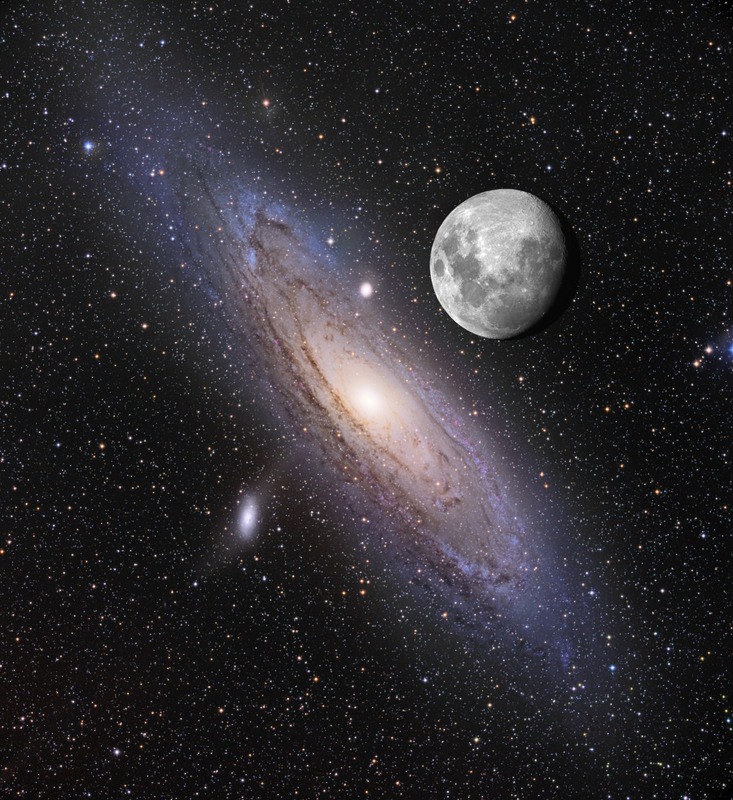 As if we didn’t already have enough troubles, the Andromeda (M31) Galaxy is set to collide with our Milky Way Galaxy. But then, as I am told, there’s no point in crying over spilt Milky Way. According to CBS News, two neutron stars in M31 just collided. By “just,” of course, we mean two million years ago—which is more than 400 times longer than when Ken Ham thought the universe was created. It took that long for the light of the collision to reach our telescopes. The CBS News website has a neat animation of what the collision with our galaxy could look like. But there is nothing to worry about, [Astronomer Dennis Overbye] noted, because long before that, the Earth will have entered the solar system’s “hot zone” and become too hostile to sustain human life, so no one [that we could recognize, in any case] will be around to experience the collision. By then Ken Ham will have been resolved into the two or three molecules that make up his brain. 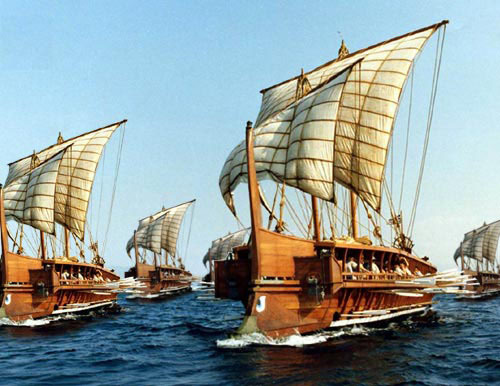 Suppose we have a complete wooden ship, and one day we replace one of its wooden planks with an aluminum one. Most people would agree that the ship survives this operation; that is to say, its identity remains unchanged. But suppose that we then replace a second plank, and then a third, until our wooden ship is made entirely of aluminum. Is this the same ship that we started with? If not, when did it change? Losing a poet is a serious thing. They tend not to get replaced often enough with others who are as good. Or maybe we have gotten too used to their voices to hear newer voices emerging from the mass. I love that image of children sleeping while exchanging dreams with seraphim. 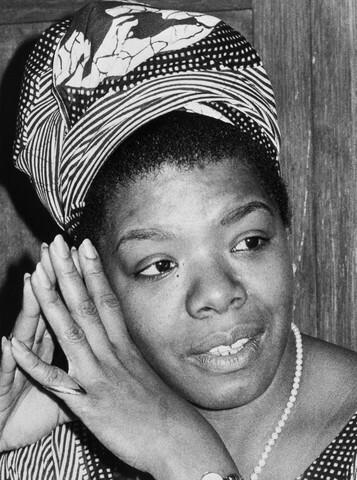 I also wear a hat or a very tightly pulled head tie when I write. I suppose I hope by doing that I will keep my brains from seeping out of my scalp and running in great gray blobs down my neck, into my ears, and over my face. Maybe that’s what I should do when I write these blogs! I was so very impressed by Czeslaw Milosz’s book Milosz’s ABC’s. There, in the form of a brief and alphabetically-ordered personal encyclopedia, was the story of the life of a Nobel Prize winning poet, of the people, places, and things that meant the most to him. Because his origins were so far away (Lithuania and Poland) and so long ago (1920s and 1930s), there were relatively few entries that resonated personally with me. Except it was sad to see so many fascinating people who, unknown today, died during the war under unknown circumstances. My own ABCs consist of places I have loved (Iceland), things I feared (Earthquakes), writers I have admired (G. K. Chesterton and Honoré de Balzac); things associated with my past life (Cleveland and Dartmouth College), and things I love to do (Automobiles and Books). This blog entry is my own humble attempt to imitate a writer whom I have read on and off for thirty years without having sated my curiosity. Consequently, over the months to come, you will see a number of postings under the heading “Tarnmoor’s ABCs” that will attempt to do for my life what Milosz accomplished for his. To see my other entries under this category, hit the tag below marked “ABCs”.I don’t guarantee that I will use up all 26 letters of the alphabet, but I’ll do my best. Today, we’re at the letter “J,” for Jorge Luis Borges. 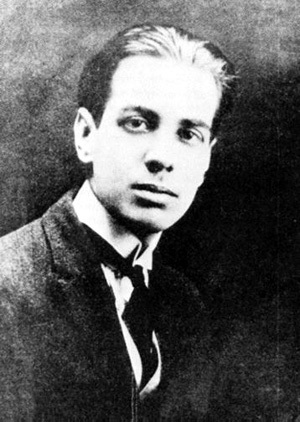 Ever since I first learned about Jorge Luis Borges (1899-1986), I have been hooked. By now, I have read just about everything that has been translated into English, sometimes two or three times. He has guided my reading for over forty years: Without him, I would never have discovered Iceland or the works of G. K. Chesterton. Without him, I would never have gone to Argentina twice, once in 2006 and once in 2011. His City of Buenos Aires has become one of the ineluctable geographies of my dreams. in that bottomless vertigo, time. and the hardest thing of all, what you love. erase the cosmos and erect chaos. Most people who know of Borges know only that he was blind. For the last half of his life, he was a kind of Teiresias. That’s why I wanted to reproduce above a photograph of the poet in his twenties. The other thing many people know is that he was singled out by the Swedish Academy to be passed over for the Nobel Prize for Literature, primarily because one member of the selection committee disagreed with his politics. This was supposedly because he accepted an award from Chilean dictator General Augusto Pinochet Ugarte. I do not care a fig if Borges’s politics are to the right of mine: All that counts is that he has had a benign, lasting, and ever growing influence on the person I have become. Look What’s Popping Up on TV News Websites? It was bound to happen sooner or later. 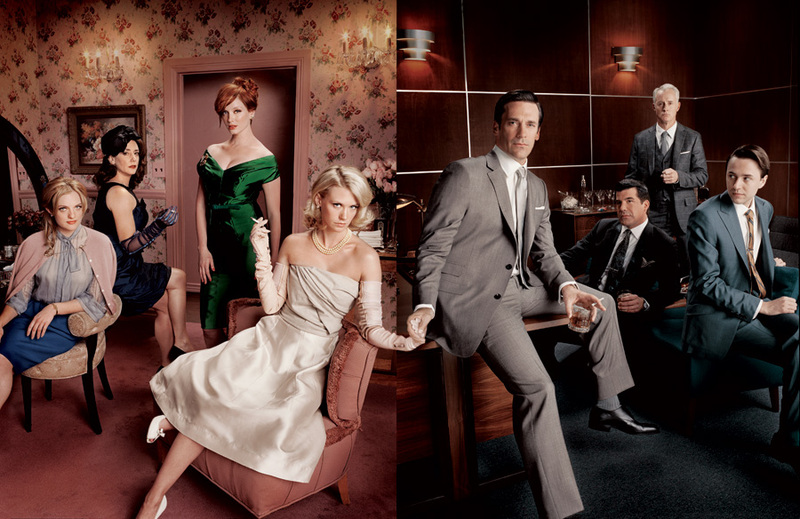 Now that the same corporations that own television news also own popular television series.One can’t look at CNN.com or NBCNews.com without running into articles about the latest developments in “Man Men,” “Breaking Bad,” or even the dwindling “American Idol.” That never used to happen before. Even Salon.Com, which insofar as I know, is unaffiliated with any entertainment producers, is heavily interlarded with references to popular shows. Since I have deliberately abandoned television programming over ten years ago, all these references in the news mean nothing to me. They end up as descriptions of cultural phenomena that are meaningless to me. In no case do I ever become interested enough to see what all the hoopla is about. I think the last time I tried was a few years ago when I rented the first season of “The Sopranos” from Netflix. I thought it was all right, but not good enough to maintain my interest. Instead of television series, it would be interesting to see more news articles about books. That occasionally happens on Salon.Com, but almost never on the mainstream media websites. Oh, well, you can always come here and look at what I am reading. You are bound to encounter quite a few books. I have made a commitment to Goodreads.Com to read 106 books this year. So far, I am 16 books ahead on my goal. Maybe I should alert CNN?